New Jersey from a Minimum Safe Distance « Midlife Crisis Crossover! I can see Springsteen from here! Flying to this year’s vacation destination had its advantages — faster travel time; free tiny snacks; no road construction delays; no rental car to return afterward while we’re all exhausted; and no danger of accidentally winding up in Newark again on our way to Manhattan. Sure, they could’ve diverted our plane to the wrong airport, but thankfully that didn’t happen. We also reviewed the New Jersey hotel options that we took advantage of in 2011, but price variances in both states over the past five years leveled the playing field in our absence. So this faraway glimpse is as close as we got to New Jersey this year. Behold the southwest view from the 101st floor of One World Trade Center, a.k.a. the “Freedom Tower”. Now open for business is One World Observatory, a must-see destination that takes visitors on a state-of-the-art, technologically marvelous, sixty-second elevator ride from the Freedom Tower’s basement to the 102nd floor without motion sickness or intense G-forces and lets them wander the 100th and 101st floors to their heart’s content. A restaurant, fancy snack counter, gift shop, and cheery guides are some of the amenities waiting stories above the rest of New York City. In upcoming MCC entries we’ll show you what else they’ve done with the rest of the World Trade Center complex over the past fifteen years. 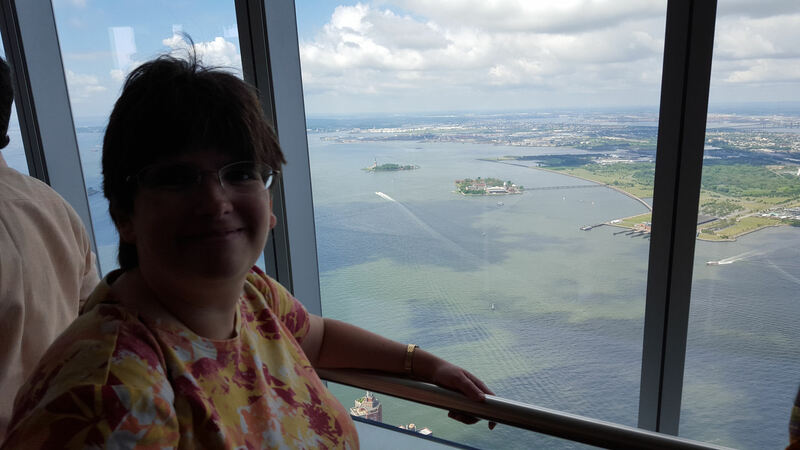 My wife isn’t normally a fan of terrifying heights, but she had no trouble with either the accelerated transport or the vertiginous view itself. Over at right is the New Jersey coastline along the Hudson River and Liberty State Park, which we visited as a one-day digression on our 2010 road trip, That’s their launch point for ferries to Ellis Island in the middle, then to Liberty Island on the left, on which, if you click to enlarge, you can just barely see the copper pinpoint that is the Statue of Liberty. Ol’ Lady Liberty may loom large over her guests, but from One World Observatory she’s a blip in the background. If you’re in the area and comparing your Big Apple rooftop viewing options, bear in mind the Empire State Building charges more to ascend to their 102nd-floor observation deck and has slower elevators. Sure, the ESB is more famous and has had a long movie career, but One World Observatory is the young upstart underdog looking to take out the king once Hollywood realizes it’s there. If you’d prefer to save a few dollars and don’t mind losing 300+ feet of altitude, the Top of the Rock at 30 Rockefeller Plaza will lift you as high as their 70th floor, which we’ve done before and can recommend on its own terms. But for anyone who appreciates either the gravitas of modern American history or the shininess of new toys, One World Observatory combines both sides of the dichotomy into an unforgettable experience, with the added bonus of letting you wave at New Jersey from far, far away.